Enjoy a journey aboard our grand lady, lovingly restored to her full glory. 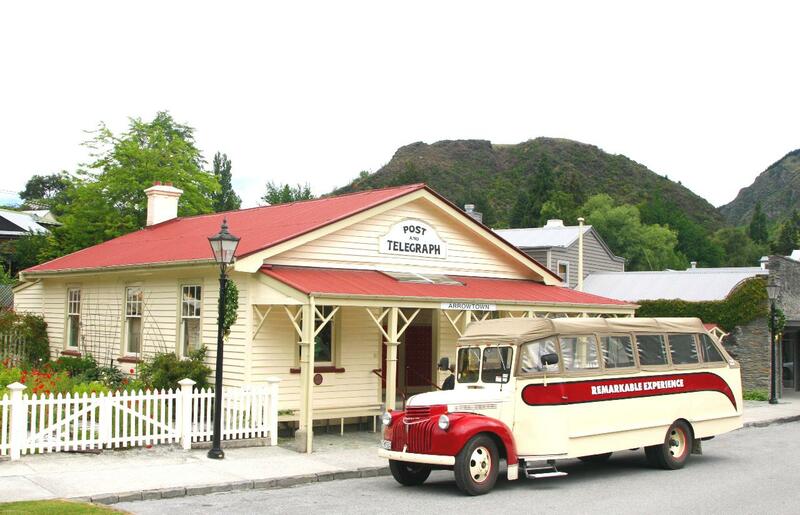 Brought back to life on a journey of exploration into the culture and treasures of the Queenstown region. Along the way you will visit charming galleries nd discover quaint communities. Travelling with the unique, convertible top down you can enjoy an open-air view of the magnificent surroundings and alluring beauty of the region. Rich and golden, moody and blue or full of sunshine and glory, bright and crisp with snowy peaks on craggy mountaintops, each day and season offers a fresh new scene. We complete a circuit from Queenstown, along rolling hills of the clear countryside and drive through the picturesque gold-mining town of Arrowtown. Travelling on to our final stop you can enjoy and taste wines grown from grapes onsite and indulge in mouth-watering cuisine in the cosy gallery or al fresco. Wander around delightful grounds of terraced gardens and ponds over looking the beautiful Lake Hayes. The journey winds back to Queenstown over the gold filled Shotover River, through pastures and around the mighty sleeping giant, Lake Wakatipu. We welcome you and take pleasure in sharing our admiration and knowledge of some of the regions treasures. Our grand lady has twenty spacious seats available each morning and afternoon and is available for charter.